Last week I went to visit the Madame Alexander doll factory, which I was excited to learn is located in NYC's own Harlem neighborhood. I know someone who collects dolls, so I thought it would be fun to take her there. Not only is it a doll factory where the prototype dolls are handmade, it is also a doll hospital where people can send "injured" dolls for repair, and a Heritage Gallery displaying hundreds of classic collectible dolls from the Madame Alexander line. I don't know much about dolls (that is to say, not any more than I knew back when I was six) but regardless, it's always fun to see something behind the scenes. 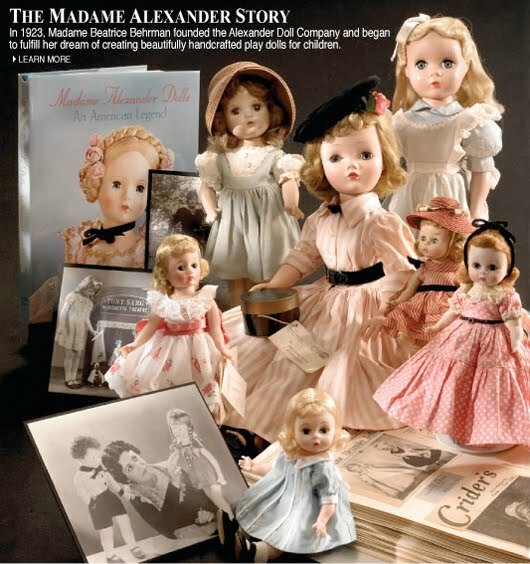 My favorite thing was learning more about Madame Alexander, the company's founder, who was a pioneering business woman of the 1920s. 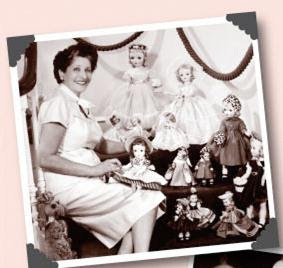 She founded her doll company in her kitchen in 1923, and over the following decades nurtured it into an internationally respected business. Bottom line: the dolls are really cute! And for me, they become more so when I realize they represent the legacy of a woman who must have faced every challenge the early 20th century posed to talented ambitious women, and still rose to the top doing what she loved. That's inspiring.